Vilkovo is a place of merge of waters of Danube and the Black Sea, it is a pearl of Danube lower reaches, Vilkovo is also called “Ukrainian Venice”, which is located directly at the sea and borders with Romania. The unusual feature of the town that its old part is on the water. There are channels instead of streets, inhabitants use special boats the so called “gondolas” which are made here and motor boats to move from one street to another. A person in the boat moves standing on the aft of the boat and making start a pole. 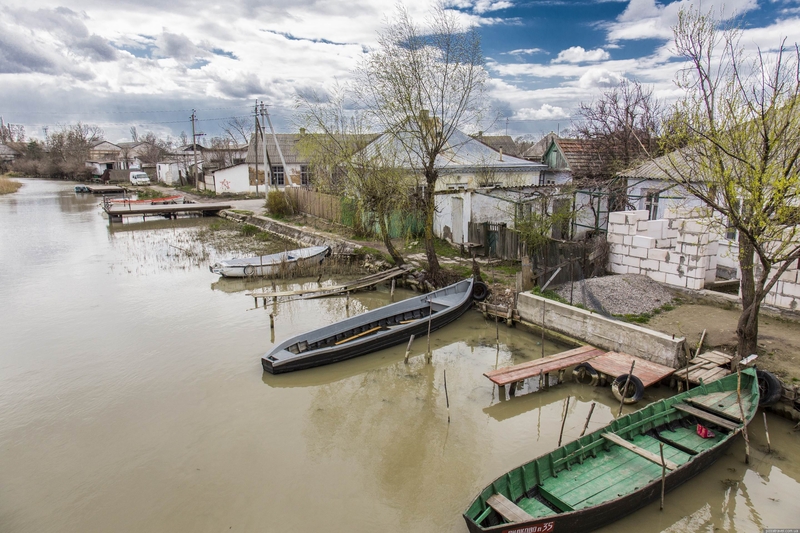 During the moving along the channel you may see white pure small houses, small kitchen gardens which are fertilized by silt, small bridges with the width of 1-2 meters which are made of wood . These channels are called “erilki” and there are beautiful small brigs across these channels. The top of these brigs isn’t fixed. If the bulky goods are transported by a boat, the top of the brig is removed and when the boat passes, the top is installed back. It turns out that these brigs are leaf bridges. Vilkovo is an original and picturesque place, here you may face with lipovanic settlements with their unusual dialects and the town of fishermen and wine makers. The town stands on the water, therefore all the ground was strewed by inhabitants. The most part of kitchen gardens is on the islands so inhabitants get where by boats. Standing in the water people get silt from the water, then dry it on the coast and then get it to the necessary place by wheelbarrows or stretchers. Fertilizers are almost not used here. Silt grants force to any plant. Probably therefore the strawberry here is the most tasty and fragrant, but there is also a special kind of grapes which is called “Novak”, it is absolutely unique kind of grapes, it grows only in this place. A wonderful wine is made of this kind of grapes and you also have a chance to buy this wine. Here there is a joke that the drunk inhabitant may be easily recognized by his giant, he is unsteady not from the left to the right side but forward-back side. In Vilkovo almost in each family there are fishermen, therefore there is a lot of fresh fish. People fish going to Danube or on the islands. Fans of fishing will estimate all advantages of silent coasts of Danube and its channels which have been grown with willows. You will see lots of exotic birds which live in overflow lands, among them you may see pink pelicans, brents, striped hawks, and well-known sea eagles. If you come to Vilkovo you will love this place forever! It is the place where the nature and people live absolutely nearby, and you may enjoy your evening just sitting on the river bank with the bottle of wine. It is incomparable feeling when sitting in the garden near the cottage and enjoying tasty home-made wine you hear the sound not after the car or motorcycle, but after the motorboat. Unusual thing for city inhabitant here is to see the way how people of Vilkovo carry the cows by boats to the pasture and in the evenings, they carry them back. It is really exotic! The visitors of Ukrainian Venice will be pleasing by numerous sights. Here the visitors may see the monument of Lipovan, and three finest churches — Christmas Church, Svjatokolnitskaya Church and Nikolaev Church, and many other things. However, the most popular of Vilkovo sights are the museum of local lore “Fisherman House”, the Danube biosphere Reserve and “Zero” kilometer of Danube. Tourists may also make an excursion and enjoy the nature of the Danube Biosphere Reserve, one part of which is located on the territory of Rumania, and the other in Ukraine. Just imagine — 276 species of birds, 43 species of mammals, 106 species of fish, 800 species of insects and 11 species of amphibian shape the diversity of the fauna here. The flora is also varied and includes 1557 species. A lot of plants and animals are inscribed in the Red Data List of Ukraine and some of them are also inscribed in the Red Data List of EU. The area of Vilkovo is about 460 hectares. Local residents here speak old Russian language till pre-Petrov times. Nevertheless, Vilkovo still remains silent and lurking place, hidden in Danube cane thickets place. This town is small. It is very difficult to lose the way here, and there are very benevolent and affable people around. The greatest Christian faith of a city is orthodox Old Believers (lipovans), the others are believers of Ukrainian Orthodox church. In the town, there are three temples: two of them belong to the Old Believers and one of them belong to orthodox. Previous articleAskania-Nova – one of the Seven Wonders of Ukraine! Askania-Nova – one of the Seven Wonders of Ukraine!